42 Rules for a Web Presence That Wins - strategies and tactics behind an effective website and social media campaign. This book was created for business owners, executives and managers, associations and nonprofit organizations who want to understand what it takes to create and sustain a successful web presence. It provides a fast, but thought-provoking read that offers a 30,000ft “hawk-eye” perspective, as well as drilling down into the many different considerations for an effective website and social media presence. The 42 Rules are based on Philippa’s 15plus years of consulting experience and research into what works at a practical level, and are illustrated with real-life ideas and case studies from her clients, colleagues and over thirty contributing experts. "Philippa's rules are very actionable and quickly digested. The tips are strong and well supported through your stories and experiences. I always love the type of books that have great factual support rather than unsupported philosophy." "42 Rules is a must read for anyone who understands the power and importance of a web presence. Philippa has given a great resource of immediately usable ideas to create and keep your brand, and your web presence strong and profitable. Keep this book on your desk—you will use it often, as I will." "I love the little chunks where Philippa lays out a concept, cites an expert, provides an example of someone doing it in real life successfully, and then wraps up the chapter with what is a reassuring, 'See how easy this is? Now you can do it, too.'" "Philippa Gamse's 42 Rules for a Web Presence That Wins is a much needed resource; at once practical and philosophical, strategic and soulful. Think of it as Strunk & White's Elements of Style for the Internet age—something you can (and will) turn to again and again as you ponder the how, what, and why's of your web presence and how to improve it." "Philippa Gamse's book offers associations useful, concrete information for creating successful websites. There are many 'how-to' books and articles on websites, but 42 Rules for a Web Presence That Wins is chock-full of valuable strategies that actually work for associations of all sizes. I have worked in online communication for years, yet still found lots of useful information that I plan to incorporate into my association's web strategy." "Philippa Gamse is a leading expert in helping companies fully leverage the web to grow their businesses. As I've heard her say, companies every day are leaving money on the table when it comes to their web strategies. 42 Rules for a Web Presence That Wins is an easy read, and right on target. This book is a road map for any corporation looking to grow their business online—which as we know is a make or break issue in today's technology driven world. If a corporation follows these rules, their business will grow!" 42 Rules for a Web Presence That Wins is the perfect book for business people who want to communicate effective and efficient Internet sales or service offerings, and obtain results from satisfied customers. This book focuses the thinking and actions required to reach and satisfy targeted audiences. As a business executive, allow me to say, 'Thank you!!'" This book was created for business owners, executives and managers, associations and nonprofit organizations who want to understand what it takes to create and sustain a successful web presence. It's primarily designed for businesses which are not pure e-commerce companies, and that probably don't have the resources to deploy major enterprise software solutions and dedicated in-house technical teams. The 42 Rules are based on Philippa's 15-plus years of consulting experience and research into what works at a practical level, and are illustrated with real-life examples from her clients, audiences and colleagues. Each rule is designed to help readers determine if the issue or idea that's being presented is pertinent to their specific situation. It explains the overall concept, and offers an example, case study, or other ideas from over thirty contributing experts including Rob Siefker, Director of Zappos Customer Loyalty Team, Francoise Gilbert, author of The Global Privacy Book, John Yunker, author of The Art of the Global Gateway, and Dan Burrus, author of Flash Foresight. Find out how to get a customized edition of the book. Read the MeetingsNet book review. "The rules may be less important than the examples! Some of the anecdotes are counter-intuitive and web 'ambassadors' will benefit simply by asking the questions implied by author Gamse's rules." "A tactical and practical guide to web activities that will help you avoid the pitfalls and potholes." "This gem of 42 nuggets that comprise a powerful web presence strategy, models what it advocates. It is clear, simple, relevant, and useful. In her easy to read style, author Gamse takes us through a well thought out process that covers the entire gamut of what to consider, where to focus, what traps to avoid, and how to optimize a web presence for any business. From the unique notion of a Web Ambassador executive position, to conscious web visitor segmentation, the book is replete with solid strategic building blocks; all grounded in the real world experience of the author and other web luminaries and implementation experts. I encourage you to read it and then use it, rule by cogent rule." Ian Browde, Director, Business Development, Endace Ltd.
"I've known Philippa for a decade and a half. We met on the speaking circuit and I was always impressed by her breadth of knowledge, her depth of insight, and her pragmatic approach to getting the most for every marketing dollar spent. But above all, Philippa delivers such wonderfully practical advice. This book is packed with scenarios, examples, and good, old fashioned common sense. Philippa is not wowed by the next new shiny marketing bauble but is laser-focused on what works, what's tried and true, and what simply makes sense. Read this book from cover to cover, but then keep it on hand. Just having it on your desk will make you a better online marketer." 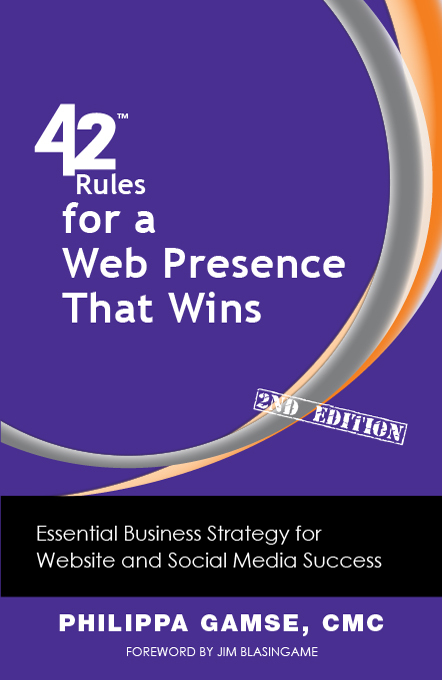 "While 42 Rules for a Web Presence That Wins is an easy, enjoyable read, it delivers content and sage advice that can profoundly affect the success of your web presence. Starting with the mantra that 'every page should have a clear strategy,' Philippa has put together dozens of gems to help you get more from your web presence and think more deeply about your business, your customers, and how to approach them. A must-read in this age of social media." "This book is ideal for any company, large or small. Philippa's 42 Rules for a Web Presence That Wins walks you through the key points and challenges of your website and social media presence. For larger companies with in-house web teams, Philippa provides an excellent list of 'checks and balances' for those who might be too close to their own material, or too used to seeing things from only one perspective. For smaller companies without dedicated staff, she gives invaluable information on how to set up and position your web presence, tell the story behind your business, and clearly deliver your message." "Truly practical advice for real-world marketers. What I most love about this book is that it focuses on the office politics, time management, and measurement battles that every real-world marketer has to deal with daily. The problem with social marketing is there's too much hype and generic 'best practices' that don't help you actually do your job in a real company. This book goes a long way to solving the problem. In particular, it contains specific tips for high tech and b2b marketers—not just for consumer brands!" "Philippa cuts through the hype and delivers specific insights on what it means to deliver a winning web presence. Read. Digest. Act. Win!" "A simple no nonsense approach to creating more value in your web presence." Doug Reigle, Chief Operations Officer, Regal Ware, Inc.
"The advice is sound and helpful. Philippa obviously know what she's talking about, and her experience speaks for itself." "I can only wonder how much more quickly and profitably we would have grown had Philippa Gamse's book been available to read during our early stages of development. Even now, it's a valuable resource that I'm making available to my entire Senior Leadership Team." "This practical book is a must-read for any nonprofit or company that needs a good roadmap for a winning home base or website in an age of social media." "This book is written in a practical, no nonsense fashion, and flows between theory and true real life examples constantly and seamlessly. It's an intelligently written, logical book that is based on experience and genuine advice. I have firsthand experience of working with Philippa—I cannot recommend the book or her personally enough." A Web strategy pioneer, Philippa Gamse has been working with Internet applications since 1991. Originally from the UK, she formed her US-based consulting and speaking practice in 1995. Philippa drills deep into the visitor experience, and creates actionable and specific recommendations for your Web presence. Clients report significant improvement in quality Web traffic, visitor engagement, customer loyalty and qualified sales leads within 30 days of implementing her recommendations. Philippa was the sole featured expert for the cover story on effective Web strategies for UPS Compass Magazine Fall 2009, distributed to more than one million businesses. She is a Certified Management Consultant – an ISO-accredited designation recognized in over 60 countries.